29 Awesome shirt from his Tita Isis (my sister). 30 Little Miss R playing in the water puddle. Check out my son playing, too. 31 Eating and wearing his dinner. 32 Sharing a mid-afternoon snack with Nathaniel: peanut butter and jelly in homemade biscuits---messy but oh so yummy! 33 Now that Nathaniel is a complete walker, he walks all over the house all day long. This is the face he gave me when I asked where he was going. 34 Did you know my son can fly?! 35 Nathaniel's dinosaur made by one of my husband's coworkers. Your pictures are incredible! Great blog. I'm visiting from the blog hop. Happy Friday! Wonderful photos. I love them all. Great flying photo. That dinosaur is so cute. Thanks for linking up. Great shots! Love number 33. The look on his face is priceless. Have a great day! These are great shots! I love the flying shot, and the eating one. Great pictures. I love the one of him flying. Beautiful photos. Love the flying shot and the dinosaur. I really want to eat that biscuit! Really nice pics! LOVE the one of him flying against that blue sky! Also love the dinosaur! 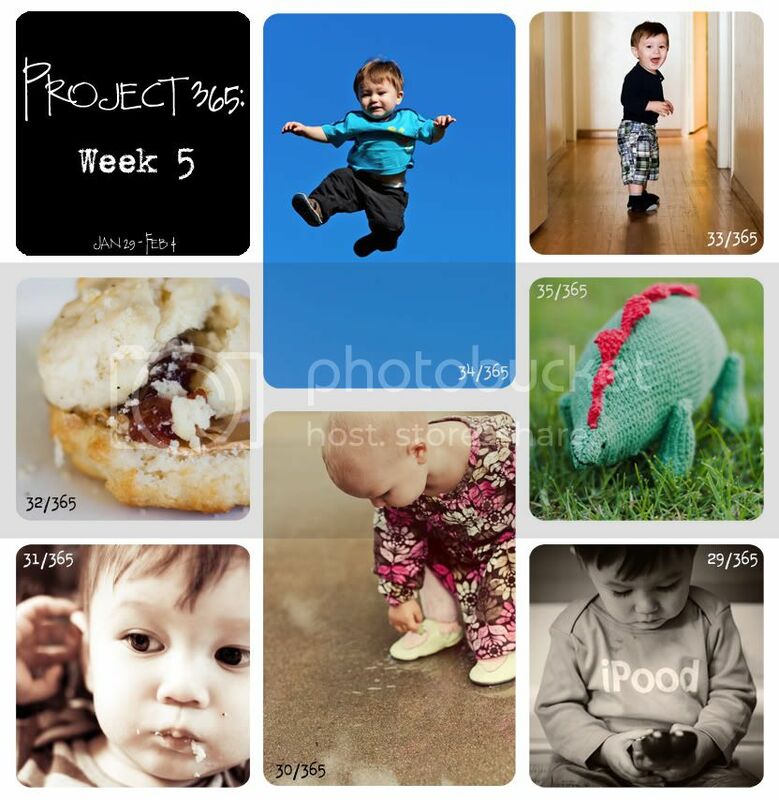 Looks like a great week in pictures! That ipood shirt is so awesome! He is too adorable! I know I say that every time but I just can't help how cute he is! Love that dinosaur and what a cute face in #33. Oh... I like that dinosaur shot! AND of course that flying one is so fun! Thank-you so much for visiting my blog. I'm so happy you did because now I found yours! I'm now happily following back. FYI I picked your photo to be a part of the January vote off for the 365 days in pictures bloghop. Great pics... love the hallway pic... too cute! and the biscuit pic is wonderful!! ;) yum! The one where he's flying and the iPood shirt are my favorites.